By the mid-nineties the UK music scene was very dance orientated (it was either that or Britpop) and one of the sub-genres was garage, but that term wasn’t new. Very much like the phrase, R&B it had a completely different meaning back in the sixties. Garage, then, was used to describe music that had quite rocky with fuzzy guitars and an element of distortion. The lyrics were usually a bit psychedelic and occasionally aggressive but not in a punk way and was extremely popular in America in the late sixties. It’s believed the term derived from bands, often professional, rehearsing in garages and helped give it its raw sound. One such band was the short-lived act Count Five who swiftly arrived on the scene in 1966 and disappeared just as quickly. In an interview with Devorah Ostrov, Ellner said, “I started with music when I was real young. I used to sing quite a bit. When I was around 10 or 11-years-old I would listen to KLIV, they used to have a contest called Name It and Claim It so I used to listen with my ear to the radio, and I’d win almost every record that came on the air! Michalski explained how he got into music, “I used to listen to a lot of the Ventures. I picked up an acoustic guitar and just went by ear. I kept listening to the radio, trying to pick up everything people were playing, that’s how I got going.” It was Byrne who came up with the group’s name, “We were thinking of band names like the Dave Clark Five, and all the other Fives – and I just said Count Five and we stuck with it.” Ellner added, “It was never The Count Five, we wanted the double entendre. You could count one, two, three, four, five; or it could be like Count Dracula. The Dracula association continued as an early publicity photo showed the group dressed in ankle-length black capes, but why that gimmick? “That was mine and Sean’s idea,” admitted Ellner, “we came up with the capes and ruffled shirts. It just fit, as we thought that capes went with Counts.” The trouble is the costumes caused the band to start sweating so they could only wear them for about 10 minutes then off they came. They toured the US and at one stage were supported by The Doors. Michalski recalled, “I remember the first time I met Jim Morrison, he said, ‘The only difference between my group and your group is that you’ve got a hit record.’ He had mustard all over his face from eating a hot dog! He was a pretty sloppy guy.” During their live sets they did a number of cover version of British songs because they liked the ‘English’ sound. Byrne said, “At the time, we did more Yardbirds’ covers than we did The Who. The only reason the Who songs appear on the album is because we did them a little better than we did the Yardbirds’, at least as far as the record company was concerned. Truth is, we did neither of them very good. 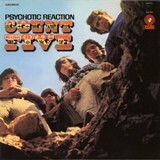 Their one and only album, also called Psychotic Reaction, was released in 1966, it contained 11 songs including two Who covers, Out in the Street and My Generation. Atkinson passed away on 13th October 1998 and Byrne died in December 2008 from cirrhosis of the liver. In 2006 Count Five was one of the first bands inducted into the San Jose Rock Hall of Fame, so they certainly made their mark.